I just got back from my painting retreat in Portugal a few days ago, and it was AMAZING. It's hard to put the experience into words, but the last 7 days really reinvigorated and reinforced my love of painting and making art. I didn't realize it until I was there that I haven't taken an art class in almost 10 years! I've been so focused on making paintings the only way I know how and have been strictly focused on trying to sell them. But I realized I forgot the joy and value of continuing to learn. During the very first class on color harmony and abstract painting, I dropped into a painting zone so deep and focused that I forgot where I was. This is me in the zone! I also met some amazing women and was reminded of the joy of being part of a positive community. I spend almost every day painting alone so being around other artists was incredible. I'm just so excited because I can use everything I learned to create even better work to share with you!! I had a lot of time to be by myself and think last week and that alone time really reaffirmed my mission of seeking out moments of joy around food and capturing them in vivid color. It also lead me to a huge realization: That I want to bring you into my art world even more than I already do! I am so excited to tell you that I am finally working on an interactive (and affordable!!!) online painting class that will not only invite you to make your own works of art from anywhere, but will teach you about painting techniques and how I use color all while celebrating my favorite subject: FOOD! CLICK HERE to get on the wait list for my painting course! So many of you have come to my workshops and classes and told me that you really wanted to get creative and learn more about painting and I've been listening and trying to find a way to make it happen! If you are interested in tapping into your creativity and getting to know my work and me on a deeper level, click here to get on the list to receive updates and be the first to sign up when it's ready! CLICK HERE to get on the list and be the first to get more info to paint with me! P.S. I'm still working on my chocolate paintings, so keep an eye out for more info on when you can get your hands on those! It's Time for the Sowa Winter Festival! Are you ready for holiday shopping season?! I know I am! I ordered tons of new prints, cards, and other fun stuff for all of your gifting needs. I will be at the Sowa Winter Festival in Boston's South End for all 6 days and would LOVE to see you there! 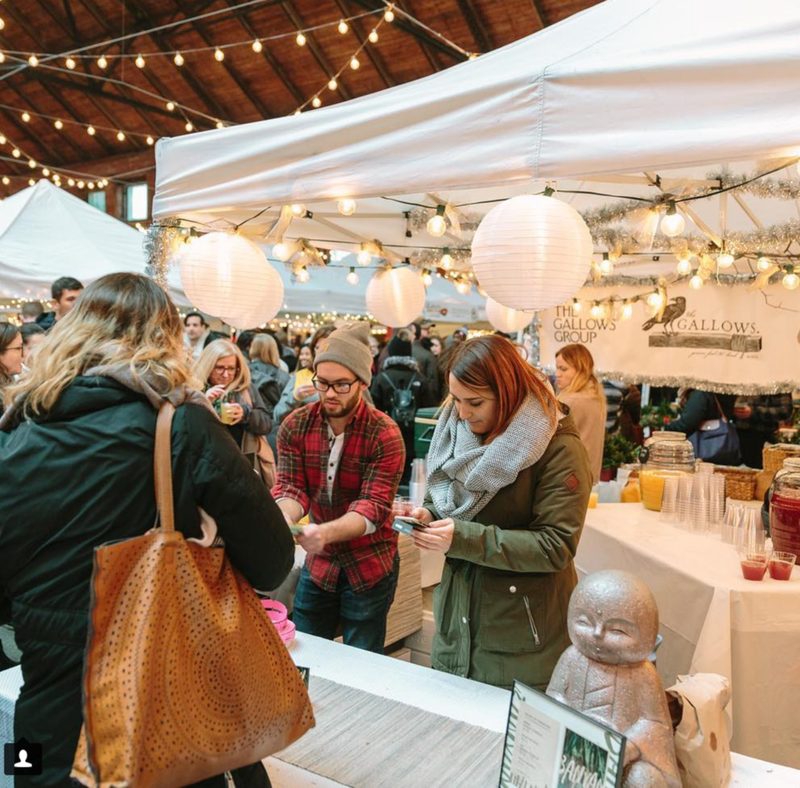 If you like shopping for holiday gifts in person and love getting tons of different gifts for everyone on your list all in one day, the Sowa Winter Festival is the perfect spot for you to get your gifts this year. Shop from over 100 of the region's best makers and specialty food vendors in the iconic SoWa Power Station. While you stroll, savor our favorite winter cocktails, seasonal craft brews and wines. The SoWa Winter Festival is family friendly and free to attend. $10 cash parking. If you’re not in Boston, don’t worry! All of my prints, original paintings, and gifts will be available online too! In fact, most of them already are. Click Here to check out my print collection and use the code SOWA for free shipping! Starting on Sunday I'll also be sharing my Black Friday gift specials. Think print bundles, discounts, and free gifts! So be sure to check your inbox for those! Until then, have a great rest of your week! As you might've seen on Instagram I've been working on my pie series for the last couple of weeks. I'm painting three 16x20 pies which will make their debut at the Sowa Winter Market starting on Friday November 30th! What's weird about these paintings is they're very pink... which is odd to me because I don't really consider myself a "pink person." In my head, pink falls into the "cuteness" category, which is a category I'm constantly trying to keep myself out of as 5'2" girl who gets called "cute" and "little" quite frequently. "Cute" isn't usually used as a negative word but it just makes me feel like a little kid. It makes me feel small and like I'm not a twenty-something woman creating an art business out of her apartment. In my head, I'm an "orange person" or a "teal person" who only uses strong, vibrant colors that make me feel big and bright and in control. But the thing is, I don't really have as much control over my colors as it seems from the outside. I mean, sure, I'm the artist and my hands are what actually do the painting, but sometimes the painting just demands to be a certain color. I don't really know how best to explain it. I was explaining this to my mom over text and she asked if it's a voice in my head or a vision or a feeling. I guess it's closest to a vision. I put down the first layer of colors, which are almost always big and bold. But then those colors ask for the next colors and I listen and layer. And sometimes the colors ask for pink. And I listen. And I end up with a painting made up of bold vibrant layers holding up the softer "cuter" ones. And oddly enough, I think I kind of like it. Want to see more original paintings? Click here!